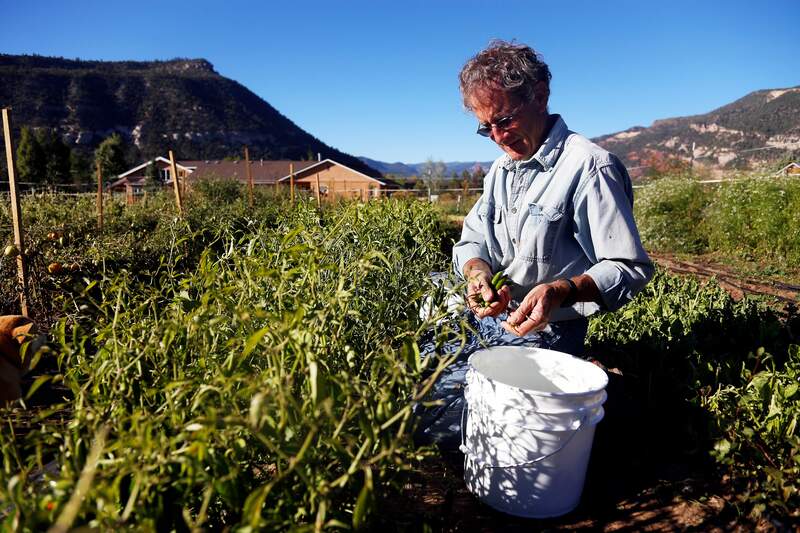 Werner Heiber harvests jalapeño peppers at Adobe House Farms that were not lost in recent hailstorms. Heiber said the peppers were being bought by Zia Taqueria, which loaned a walk-in cooler to farmer Linley Dixon, after last week’s hailstorm. Heiber credited the restaurant for being very supportive of local growers. 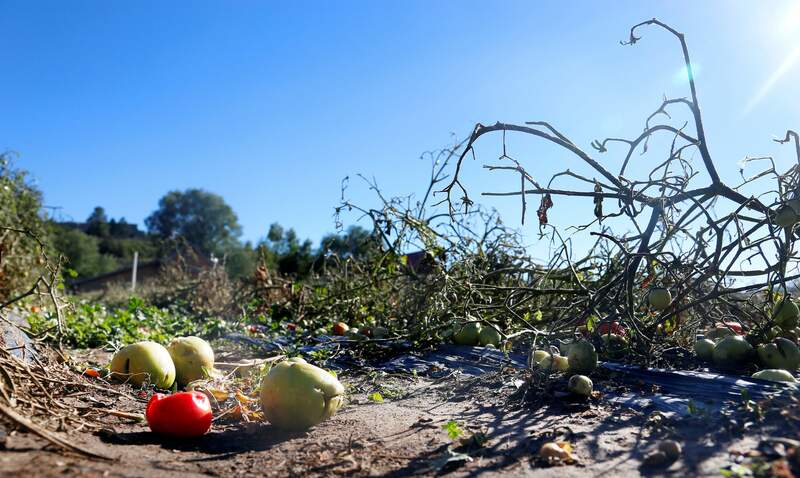 Tomato plants and fruit wither in the aftermath of hailstorms that damaged the crops at the Adobe House Farm. Linley Dixon of Adobe House Farm and Linda Illsley work to process about 5,000 pounds of fruit saved from hail-damaged plants. Green tomatoes often can substitute for tomatillos, adding a tangy acidity to salsas and stews. 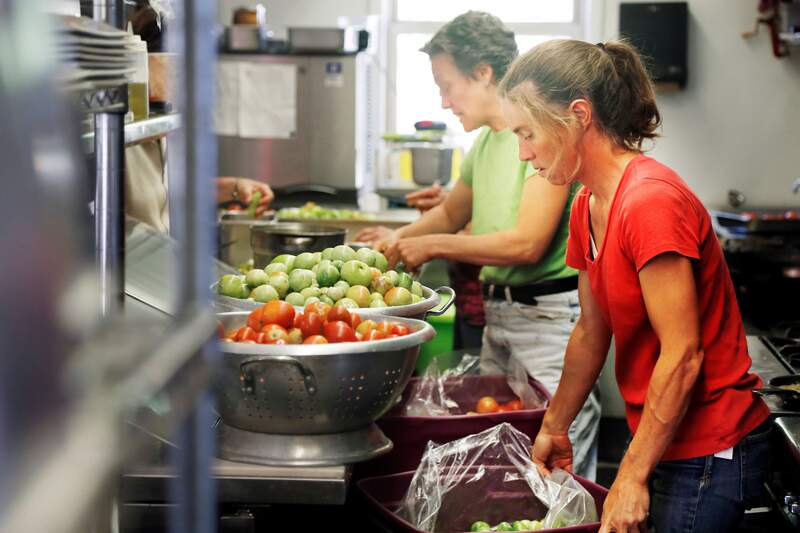 Volunteer Tish Varney cuts hail damage from tomatoes at Linda’s Local Foods Café during efforts to process about 5,000 pounds of fruit salvaged from Adobe House Farm. The all-hands-on-deck effort required that the tomatoes to be processed within 48 hours of the storm. 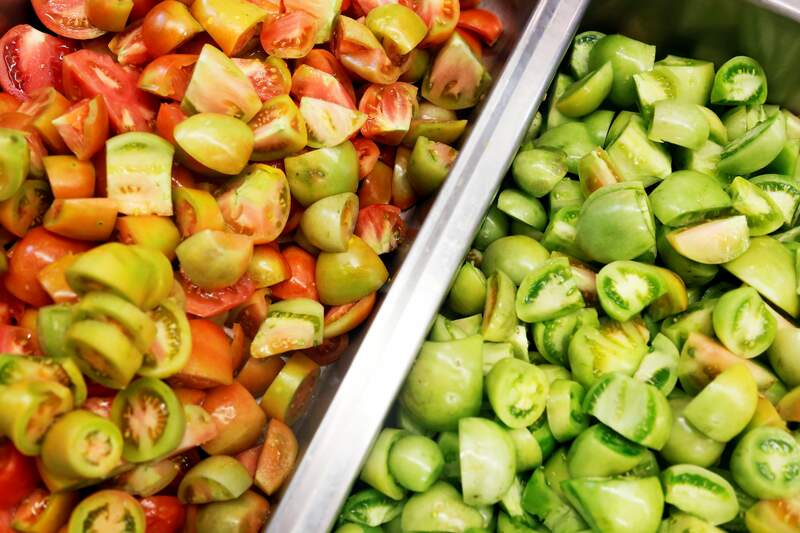 Tomatoes are separated and quartered to make green tomato chutney and red tomato salsas at Linda’s Local Food Café after being saved from hail-damaged plants at Adobe House Farm. C.J. Clayton and Sue Plvan sort through apples to be made into cider during the 2012 Apple Days Festival at Buckley Park. This year’s festival will be held Sunday. Harry Leland of Durango scavenges apples. Leftover fruit from backyard trees will be pressed into cider at the Apple Days festival Sunday. We live in a land of waste yet want. Gleaning, the gathering of food that normally would go to waste, helps feed the hungry, but it’s not a practice that is widely understood, let alone practiced, in this land of plenty. As much as 40 percent of our food ends up in the trash can or is left on the ground simply to rot. One figure from the National Resources Defense Council estimates that Americans waste $16.5 billion a year getting rid of or ignoring food that others say could go to the mouths of the hungry. Which of the hungry, you ask? Not the starving Armenians or bloated-bellied African children our anxious parents referenced when they urged us toddlers to clean our plates. No. These hungry mouths are just a state or two away, in the next county or maybe even right next door. “Hunger in America 2010,” the largest study of domestic food assistance in the United States, says 1 in 5 children struggle with hunger. In New Mexico, 30 percent of children live “in households without consistent access to food,” the study found. Food insecurity exists in every county in America, ranging from a low of 2.5 percent in rural North Dakota to a high of more than 35 percent in Mississippi. It’s here in Durango, too, said Darrin Parmenter, La Plata County Extension director. “I tell people to plant more than what they can use. Plant the extra row. Lots of people even in this county can’t get a sample of fresh fruits and vegetables,” he said. Plant, harvest, then what you don’t sell or use can be donated to Manna Soup Kitchen, Parmenter said. He calls this form of organized gleaning a “synchronized distribution channel” in which high-quality, unsold produce makes its way to someone’s dinner plate, rather than to the Dumpster or compost pile. Large-scale gleaning, what is practiced in some parts of Europe, doesn’t happen here in Durango as it might in the massive orange groves or cornfields of Florida, Parmenter said. Large commercial farms hire pickers to selectively remove one or two of the biggest ears on the cornstalk to go to market. Then, a second crew might take the less desirable or blemished remaining ears and repurpose them, paying the farmer substantially less for a “seconds” crop that’s equally nutritious. 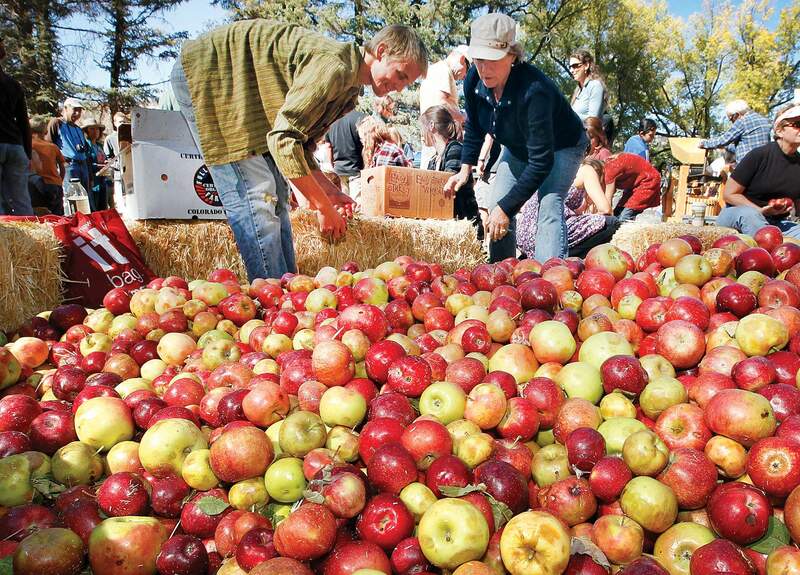 The best example of local gleaning will happen Sunday, when volunteers pick apples for Growing Partners of Southwest Colorado’s Apple Days, a family-centered celebration to be held at Buckley Park in downtown Durango. Scheduled activities include pie-eating contests, music and games, and all things apples will be sampled and sold. Four apple presses will crank juice from excess apples gathered from the community’s backyard trees. Fruit that might otherwise attract wildlife or just fall to the ground and rot is thus enjoyed rather than wasted, Parmenter said. “That’s the idea,” said Linda Illsley of Linda’s Local Food Café. “Every year, thousands of pounds of produce go to waste because farmers can’t pick crops fast enough. It’s a labor issue,” she said. Illsley said small-scale farmers often can’t afford to hire enough help at the peak of harvest or when a hailstorm or frost moves in unexpectedly. When a recent hailstorm damaged Adobe House Farm’s tomato crop, Illsley, Parmenter and San Juan Basin Research Center’s Beth LaShell, a Fort Lewis College professor, sent an email blast to recruit volunteers to pick 5,000 pounds of tomatoes in less than 48 hours, Illsley said. This, too, is a form of gleaning, because what could not be gathered that day would have gone to waste, Illsley explained. 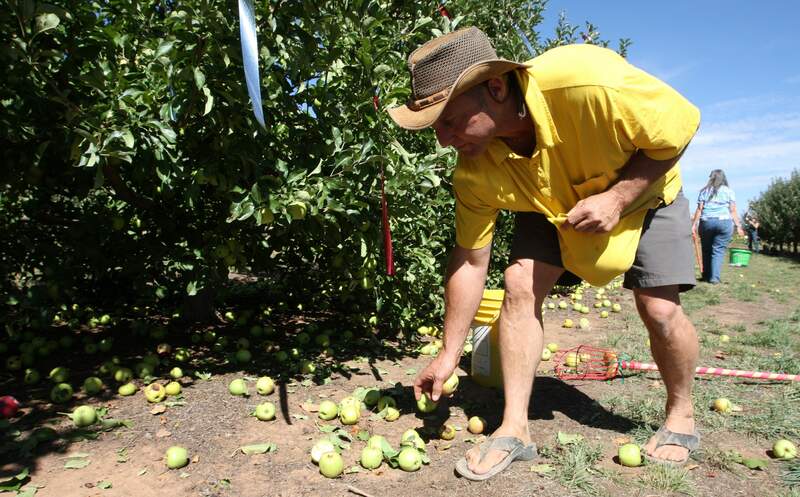 “Every tomato – red or green, mature or not – had to be picked,” Illsley said. About 70 percent of the gleaners were students from FLC, said Adobe House farmer Linley Dixon. The others included retirees and folks who came after work to pitch in with the behemoth task. Volunteers hauled 50-pound boxes of sorted tomatoes to the new walk-in cooler at Zia Tacqueria South. Zia owner Tim Turner stored the crop overnight until another team of volunteers cleaned and quartered them, removing small spots of damage caused by the 10-minute hail assault. 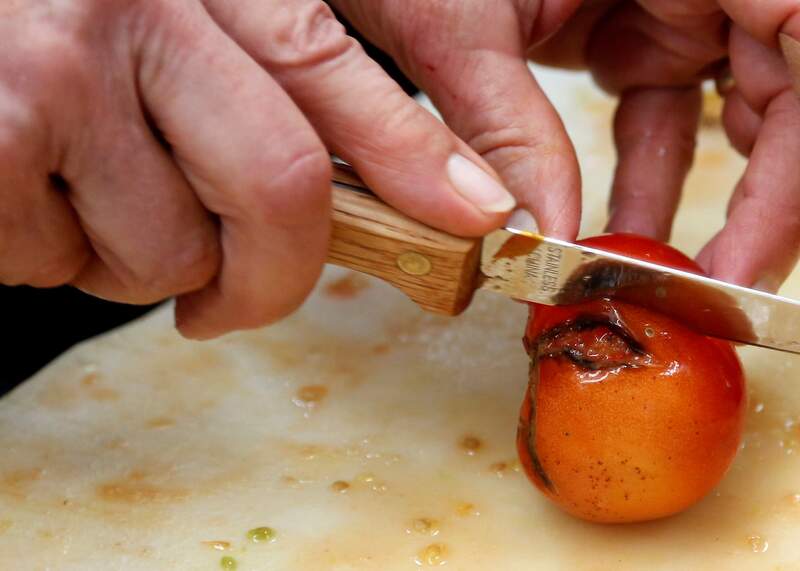 Many of the tomatoes were cooked and frozen for later use, Dixon said. Americans have a high aesthetic standard for their food, both Illsley and Dixon said. Some consumers select produce based on appearance rather than taste or nutrition. Thanks to Illsley’s creative resourcefulness, the less-desirable crop of dinged tomatoes was quickly turned into roasted tomato salsa, Dixon said. The first batch of salsa sold out within a few hours Saturday at the Durango Farmers Market. “We definitely took a financial hit, plus we didn’t know how this product would sell,” Dixon said. Dixon said the support she received shows how much locals understand the challenges of running a small farm in a place where the growing season is short and unpredictable. Away from the farm, gleaning can be used to harvest nutritious foods that grow wild, including chokecherries and Hawthorne berries, said Katrina Blair, founder of Turtle Lake Refuge. Blair credits local events such as the Apple Festival in the fall and the wild Dandelion Festival in the spring with teaching the community to become more self-reliant and waste less.